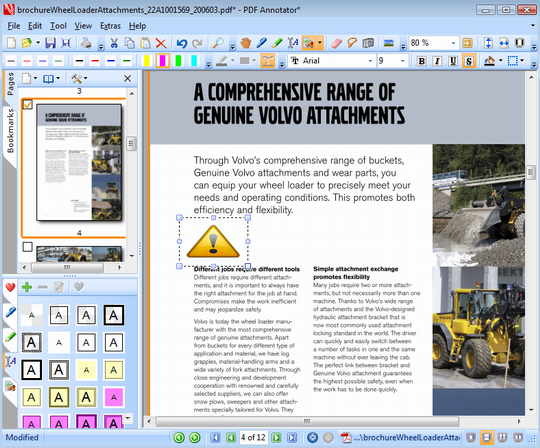 PDF Annotator turned out a very attractive and convenient program. You need several minutes to make your PDF document easier to read and understand. Without any doubt, PDF Annotator is a must have tool, first of all, for students, teachers and other professionals working in the field of education. Gone are the times when students and teachers used printed materials in studies. Sure, books and print-outs are used now as some people prefer reading everything on paper. But as a rule these materials are printed versions of e-books, e-documents and other files stored in computers. Moreover, many schools and universities create web servers where they share curriculum materials to which students have unlimited access. Perhaps, you remember the times when we used markers, pens and pencils to mark texts. Thus, a manager would use a marker to highlight the key points of his presentation or important elements of a price list. Students often leave comments to curriculum materials and mark the most important abstracts, definitions, terms etc. As known, documents are being constantly amended. This is requirement of the modern age of information. It is importantly to timely introduce changes to documents, mark those parts of files which are most important to you or target audience. PC users often use PDF files to make study materials, description of products, pricelists, technical specifications of cars, home appliances etc. Sometimes, it is very important to mark certain parts of text, place “Nota bene” sign, add comments to certain lines etc. If you use electronic versions of documents (PDF docs) this task seems like a problem. However, if you use PDF Annotator from GRAHL software design, you resolve such a problem. Moreover, you will be delighted to use this software. 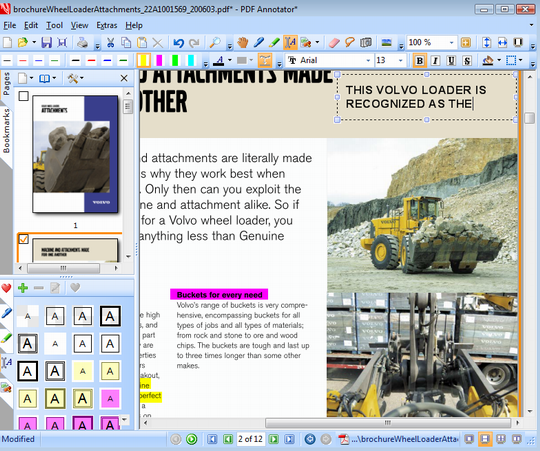 Efficiency and good looking design are two core advantages of PDF Annotator. In order to fully evaluate the program we need to review its basic features. This program will surely bring you back to the college times when you used marker in your studies to make your printed lectures multicolor. First of all, it needs saying that PDF Annotator will remind you of a well known Adobe Acrobat Reader. Traditionally, you may switch between bookmarks and pages in the left panel. Main and additional menus look pretty much the same as in Acrobat Reader. Of course, they differ in contents and as PDF Annotator has one ultimate goal – to add various types and marks, notes and annotations to pdf files. 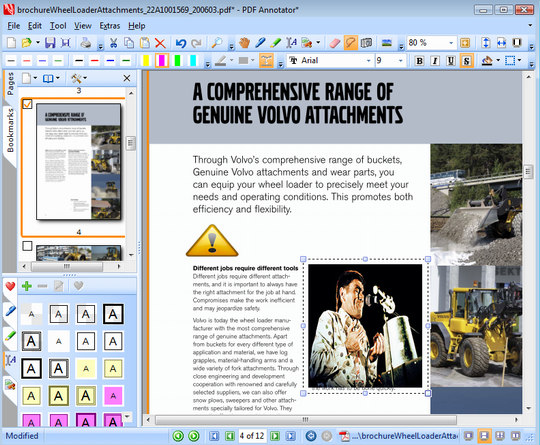 Using PDF Annotator you can create own pdf docs in which it is possible to paste images, and texts stored in your PC. But the most prominent function of PDF Annotator is marking documents. Let’s review it in detail. Imagine that you have a college lecture in pdf format consisting of 20 pages. Sure, there are more important parts, like definitions and general conclusions, and background theory which is not so crucial for you. If you are using Tablet PC or a laptop in your work you cannot use pen to mark printed text. All you need to do is to run PDF Annotator, open relevant documents and switch your attention to pen and marker toolbars. want. You have just one goal – make yourself pay a special attention to certain pieces of text. Or you might want your students to pay a special attention to some abstracts and key words. You may use different colors and line thickness. If you are good at handwriting in image editors, you may use pen to add handwritten comments to any line of text to make it special. There is a very interesting and useful feature which deserves a special attention. It is very difficult to draw a straight line with the mouse pointer. Do not worry! PDF Annotator will straighten the lines for you. Of course, if you draw a circle the program will not make it a straight line. But if your marker line is somewhat uneven it will surely become straight if you use Auto-smooth function. By the way it is possible to change location of all annotations, including marker lines. All you have to do is to select it and remove to another part of doc or delete forever. 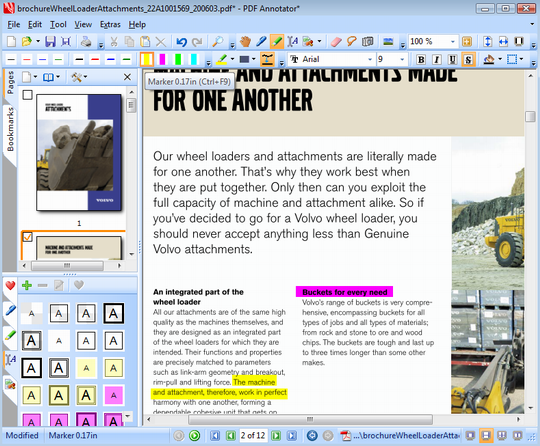 PDF Annotator makes it possible to add comments to any lines of text, pictures, separate words etc. Just choose a text tool and either paste or write relevant text. As in any text editor PDF Annotator has a familiar tool bar where you can choose font, its style and color, and well as background coloring. You may use this tool to add footnotes or notes on the sides of the document. Text annotations can be also amended or completely removed from the file. Using PDF Annotator, you can add special signs (stamps) to the text. For instance, if you want to draw attention to particular text abstracts you may place there exclamation sign or a star. If some statements are very ambiguous it would be logical to add a question mark. All signs have different colors, and they will not be unnoticed. Besides, this is the perfect way to make your document special, and perhaps, not so boring. Do you think that your pdf document is incomplete? Do you feel that it lacks something? Right! An image! Why not add a funny image to a boring lecture? Or why not illustrate a definition with a picture? Just go to Edit-Insert image, select a picture and choose its location in your document. You are free to change image size and positioning on the page. This is a great tool which will save your time and adds to the document integrity and topic coverage. several minutes to make your PDF document easier to read and understand. Without any doubt, PDF Annotator is a must have tool, first of all, for students, teachers and other professionals working in the field of education. Get PDF Annotator: Download now, Buy now.